The Law of Unintended Consequences takes place whenever outcomes present themselves that were not expected by one’s action. In a Connectional Church like the United Methodist Church, such reverberations are felt sometimes long after decisions are made as new groups of people make use of polity and ecclesial changes. Green Street United Methodist Church in North Carolina has exposed one such unintended consequence of Judicial Council Decision 1032. That was the subject of our last blog post. But there’s another: an understanding of what Biblical Obedience means. Green Street UMC is getting some major press in the last week as it is a local church that has decided to place a moratorium on weddings in their Sanctuary until they can offer weddings to their lesbian and gay members. 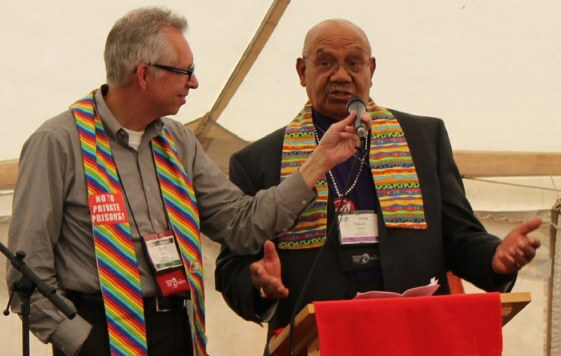 Their resident Bishop and the President of the Council of Bishops say their actions are legal in our polity. But they’ve also opened the floodgates of online criticism, as folks on Twitter have had scalding things to say from their armchairs (or cheetos-stained basements). And one keeps on being mentioned: that even though the Church’s actions were legal according to our Doctrine (see last post), they are not biblical. See for example this redacted Twitter conversation with Traditionalist Straight People (easy to un-redact but why give people more traffic?). 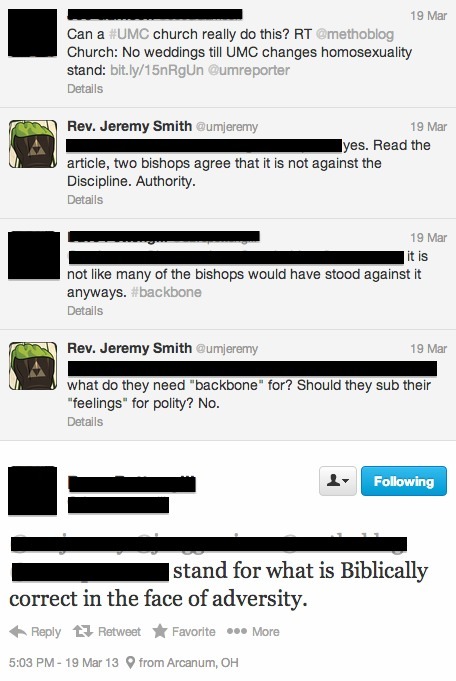 The sentiment (modeled here but I’ve seen it in other comments elsewhere by Traditionalist Straight People) is that the Bishops should support biblical marriage rather than the polity of the church that allows for the Green Street decision. That even though our polity allows for Green Street to make this decision, because it is a slight against “biblical marriage” the Bishops should have stood on the Bible and not the Book of Discipline. Interesting. 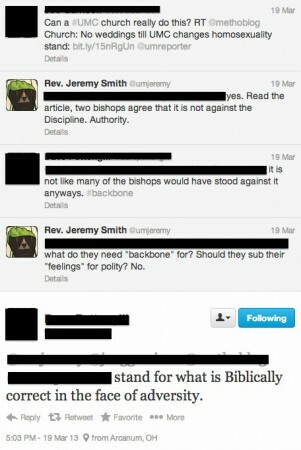 To follow the bible rather than the letter of the church law…Where have I heard that sentiment before? My brothers and sisters I declare to you that same Gospel imperative: do this and live. In light of the actions taken by the General Conference, the time has come to act and to invite others to join what I’m calling an act of Biblical obedience. It’s the same argument as the detractors to the Green Street situation: When the Discipline falls short, be obedient to the Bible. It’s awfully hard for Traditionalist Straight People to oppose a movement that embraces a Gospel call for inclusion against the Discipline, and simultaneously proclaim that Bishops should embrace the bible over the Discipline’s limitations. So the Traditionalist Straight People who say “Green Street should take the ‘United Methodist’ off their yard sign” or “they need a change in pastorate because this one has failed” or “their option is to leave if not in agreement with UMC Doctrine” are being hypocritical if they oppose the Green Street decision on biblical terms AND oppose the Biblical Obedience movement because they both involve almost the exact same sentiment. Agree with Progressives that sometimes the Gospel is more important than the Discipline. And this can lead to a discussion as to Biblical interpretation and how the Bible supports both inclusion of LGBT people and exclusion of LGBT people. Double down and state that the Discipline trumps everything–including the Bible. And then we’ll see where the denomination’s growth is in 30 years when young people leave a church that values the words of men over the Word. If Traditionalist Straight People reject both of the above, then clearly their concern is not about the rules or biblical fidelity…but about homosexuality. And let’s just name that, instead of hiding behind anguishing over biblical authority, okay Traditionalist Straight People?